In last November's IAEE meetings, Amory Lovins reported estimatesof energy saving that will result from the adoption of more efficient appliances. This note addresses three questions related to the subject.1. The realism of Lovins' estimate of energy saving.2. The way these estimates fare when juxtaposed against the price elasticity of demand used by Lovins.3. The light my recent empirical results shed on the magnitude of energy saving we can realistically expect.In the process, the note touches on the polar opposite policies that Lovins has been advocating. Proceedings - Residential bottom-up load modelling with price elasticity. 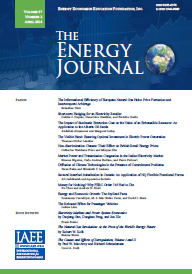 Published in Volume 8, Number 4 of The Quarterly Journal of the IAEE's Energy Economics Education Foundation.